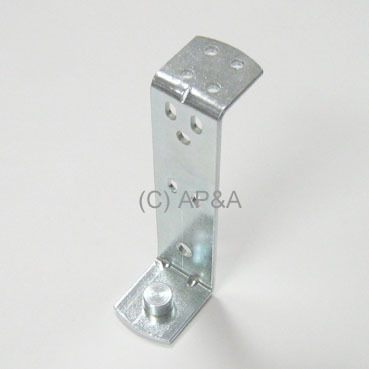 Mounting bracket with built-in coil stop. Used for many devices on many Bally/Williams games, but can be used on other makes/models as well. Used for slingshot bumpers, kick-out saucers, eject holes, ball release, ball launchers/kickers, etc. Replaces obsolete part # B-7572-1 (part of B-9362-R-1 and B-9362-R-3 assemblies). Can be used in place of Data East #s 515-5011-00 & 515-5369-00, Sega/Stern # 515-7132-00, and similar others.